When I was watching Tokyo Mew Mew I decided that I had to cosplay one of the characters. I chose to cosplay Zakuro because she is the mysterious one who as more wisdom that the other girls and is fierce at the same time. I also really liked her design. I decided to go with her transformed costume because I wanted to make the ears and the tail to get some experience working with fake fur. Shorts - Zakuro's shorts have an interesting design to them. Instead of a normal pair of shorts, they have princess seams. This meant that I would need a custom pattern. I started out by getting my boyfriend to wrap me up in saran wrap, then taping over that, then marking off the seam lines and then cutting myself out of the plastic wrapping. The plastic wrap still held the shape of my body even when it was removed. 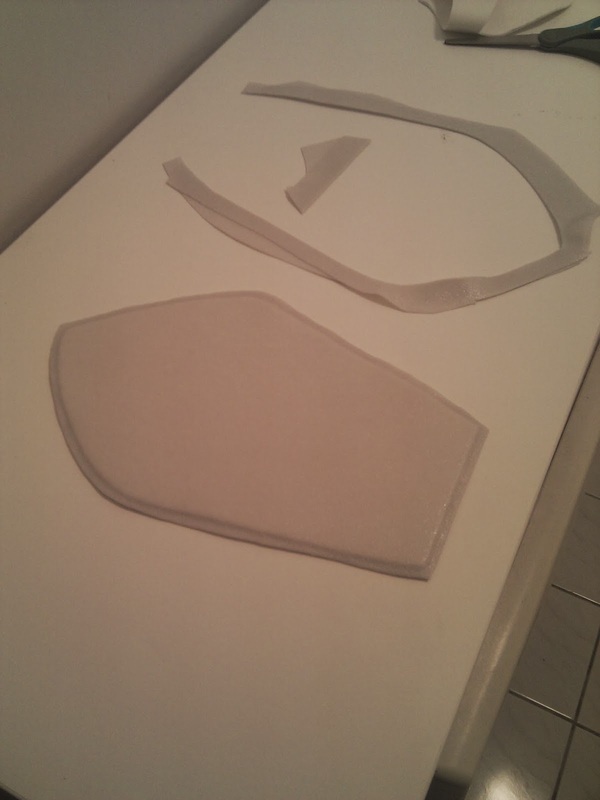 To draft the actual pattern, I flattened each piece on a sheet of paper and traced around it. I added my seam allowance and some ease. 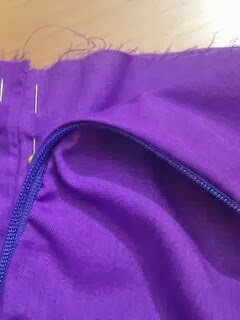 I used a seam allowance of 1.5 cm and a design ease of 1.25 cm per seam in the crotch area. The ease that I added around the hips was very minimal. Once all the pieces were drawn out I noticed that the left leg was different from the right leg. I decided that since both legs were supposed to be the same design that I would discard the pattern for the left leg and just use the right leg pattern for both sides. I ended up with a front center panel, a front side panel, a back side panel and a back center panel. I made up a draft using some cheap leftover material to check the size and the lines of the shorts. I edited the pattern to level out the bottom line of the shorts and raise the waist line in the back. The shorts are made out of a purple poplin fabric and they are fully lined. I took both pieces and altered them so that they fit to my curves better. This meant that I had to take in the seam allowance a bit more in certain places, particularly in the back. Sewing the lining and the outside together was an interesting exercise. I followed the tutorial that can be found in the references link. Once the lining and the outside were joined by the bottom hems, I added in the invisible zipper. It was my first time inserting such a zipper and I did it without a special foot! I just used the normal zipper foot. For a glimpse at the tutorials I consulted, again they can be found in below. Once the zipper was attached, I drafted the pattern for the waist band. It ended up being a little too thin for my liking but it still works. The seams lines don't all line up because I didn't make the same adjustments for the waistband as I did for the shorts (I forgot >_>). Once the waist band was sewn on I added some snaps in the back to close it up. Yay! 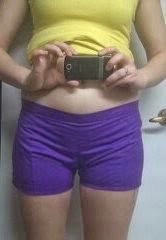 My first pair of shorts, and the best part is that I can actually wear them as normal clothes! Top - The top was drafted in the same way as the shorts. I wrapped the saran wrap and the tape around myself (it was really hard!) and drew on the lines marking the pattern by looking in my mirror. The top consists of sixteen different pieces, eight for the bodice part and eight for the under bust band. 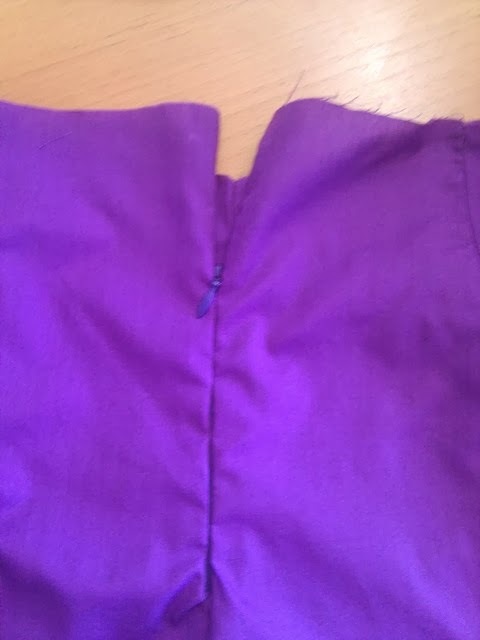 I used the same amount of seam allowance as the shorts but changed my ease measurements. I only added 0.2 cm to each measurement for the ease. Of course when I actually made the first layer it was too large around the waist. I had to alter it to fit and then changed the pattern so that my outer layer would match it. I made sure that I had enough fabric to overlap in the back as I was using snaps to fasten it. The piping used a thick cord and some white fluffy molleton. I slip stitched it in between the two layers of the top. The top is quite tight and stays up nicely. I have to be super careful not to bend down too low as the snaps will un-snap. I'm thinking of getting some topstick to use as a precaution. It's super tight now but that doesn't mean it won't slip at the con! Boot covers - These particular boot covers were annoying to make. I ended up having to trash the first pair because I made them too small. Again the basic pattern was drafting using the saran wrap method in a combination with measurements. I used the first pair of boots to determine where I was short material and then added extra to those spots for the second pair. 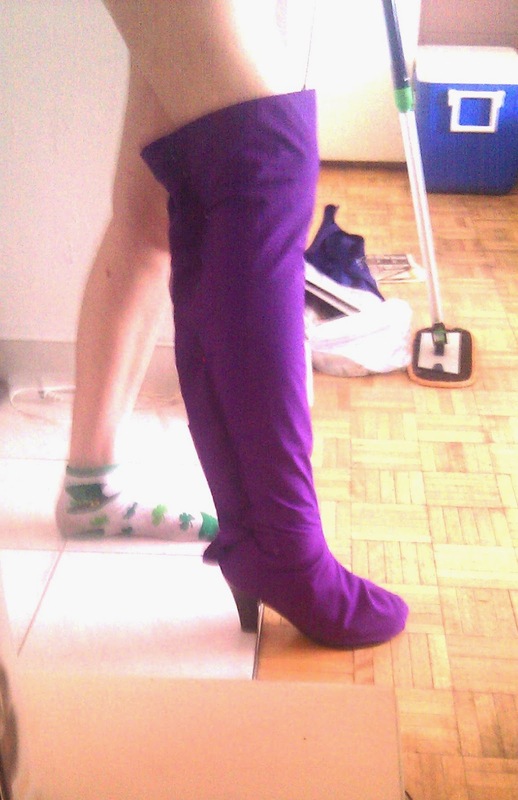 I then fitted the overlarge boots to my leg using pins to determine where I was going to put my zipper. I wanted these boot covers to be removable and to be able to withstand being walked all over. I went with a pattern that had a "sock" part go around the toe of the shoe and used a zipper in the back to close up near the heel. The sock part was made using felt to offer slip resistance and higher wear and tear resistance. The zipper was inserted upside down so that it opened from the heel rather than from the knee. The boot covers are fully lined and have fused interfacing near the top to help keep the stiffness. Arm/leg bands - I had to think for a while how to approach the bands. I needed to have elastics in them but I also needed them to have piping. It took a few tries but eventually I figured out a way o make them. 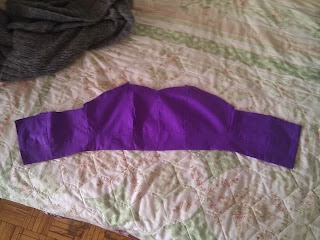 I started out by cutting two rectangles of purple fabric. I then cut out two thinner rectangles of the white moleton. 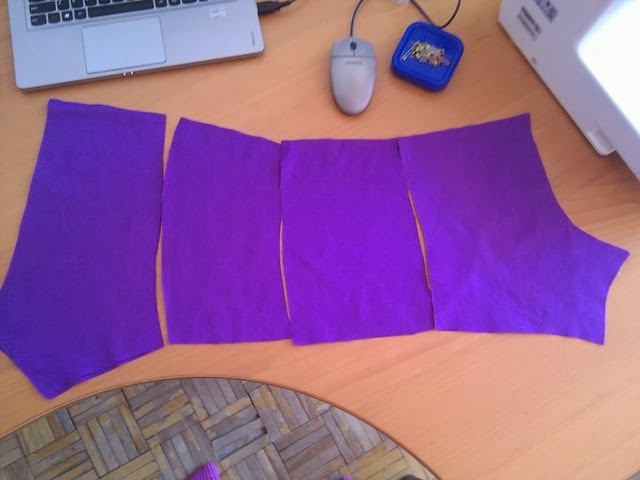 I sewed all four pieces together, alternating between the purple and the white so that I got a large striped rectangle. I sewed the ends together to create a band. Next, I folded it over to expose the right sides with a white stripe facing up. 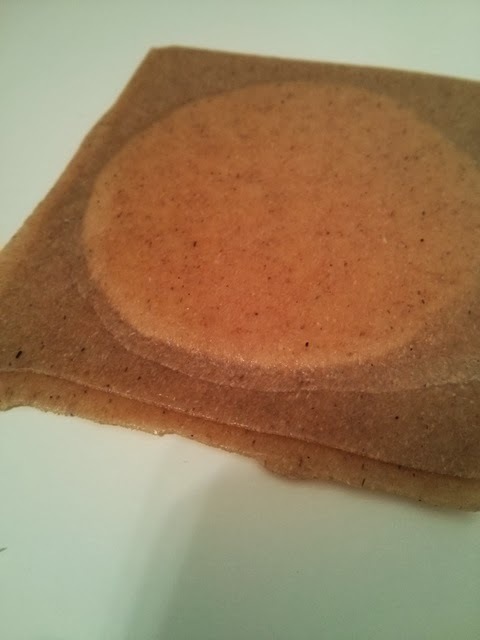 I placed a elastic band under the fabric so that when the fabric was pinched together it created a casing for the elastic. I then stiched in the ditch, encasing the elastic in the moleton, thus making one set of "piping". To finish the bottom, I slipped the other elastic over the loose white part. I folded the white under the purple, pushing both raw edges into the elastic casing. I then sewed with minimal seam allowance along the white/purple border to finish the band. Choker - The choker is comprised of a strip of purpler fabric with white piping along the top and bottom. It attaches in the back with a strip of velcro. The pendant was made using scuply and painted over with acrylic paint. It is hanging from the collar with matching yellow thread reinforced with a blanket stitch along the length to give it strength. Wig - I originally bought a purple wig off of cosplay.com but when it arrived in the mail, the wig was too dark. I tried to lighten it using white sharpie (oil based paint) but it left the wig speckled and weird in texture. I was forced to bite the bullet and buy another wig. 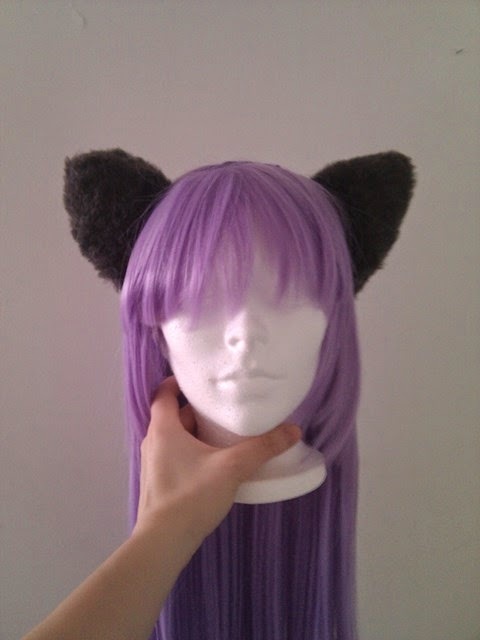 This time I went with the Anime Stuff Store and bought a lavender Tomoyo wig. It came in the mail and I instantly loved it. The wig is soft, it's easy to untangle and it was a beautiful colour. Ears & tail - Both the ears and tail were made using a dark grey, short faux fur material stuffed with scrap fabric. The ears were stuffed to the maximum and attached to a thin fabric covered headband. The tail was loosely filled with a wire running through it to hook onto the back of the shorts. 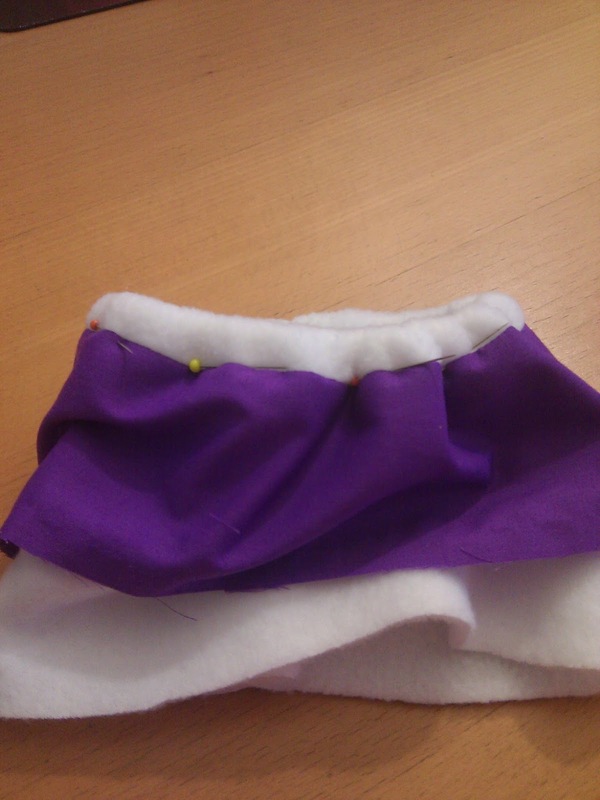 As a precaution, the tail also ties around the waist using a purple ribbon. Magical item - The base of the cross was made using jewelry wire. Scuply was then molded over the wire until the desired shape was created. Details were added using extra sculpy. It was baked in the oven and primed with gesso before painting the finals details.